Whether you love a versatile jelly roll, or a perfectly cut fat quarter, every quilter has that one magical bundle that seems to work for anything and everything. That's why we've compiled this list of 25 Popular Jelly Roll Quilt Patterns, Fat Quarter Projects, Charm Pack Quilt Patterns, and Layer Cake Quilt Patterns. Jelly roll quilt patterns have become a big sensation, and it's not hard to see why. Magic Jelly Roll Quilt - This simple jelly roll quilt pattern is one of the most popular. Illusions Quilt - Make an impressive design with intricate blocks. Pieces of the Puzzle Quilt - Here's a creative jelly roll quilt that all ages will love. Road Fifteen Sixteen Patch Quilt - Challenge yourself with a large nine patch variation. Gobble Chain Quilt - Make a gorgeous new quilt for a king sized bed with this chain quilt pattern. When you're in need of smaller cuts, you can always rely on a fat quarter. Afternoon Six and a Half Dozen Baby Quilt Pattern - Finish this adorable baby quilt in a few hours. His and Hers Bed Quilt - Design an endearing bed quilt for a couple. Royal Star Quilt - You'll need you best fat quarters to make a stunning star pattern. Urban Shades Quilt - Contemporary quilters can take an artistic approach to their quilting. Glorious Garden Floral Quilt - Make this for the nature lover or gardener in your life! Versatile charm packs are essential for many amazing quilting designs. All Star Baby Boy Quilt - The perfect baby quilt pattern doesn't need to be complicated. Rainbow Diva Quilt - Amaze with colorful geometric shapes. 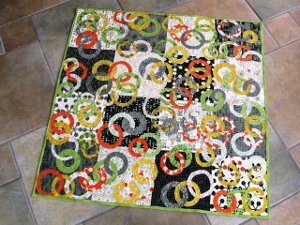 Simply Circles Quilt - You can define your own style with playful drunkard's path blocks. Jiggity Charm Pack Quilt - Experienced quilters will love the challenge of this wonky charm pack quilt pattern. A Hundred Hugs Baby Quilt - This is an easy baby quilt pattern made with a variety of small charm pack patterns. A big pattern that's going to make a big impact needs some layer cakes. Speedy Strips Layer Cake Race Quilt - Apply this quick method and make a new quilt pattern fast. Ring Around the Baby Quilt - The intricate ring design is much easier than you think; just use applique. Neon Starry Terrain Quilt - No star quilt stands out quite so vibrantly. Luscious Layer Cake Baby Quilt - A blocky layer cake quilt will be a perfect baby blanket. Piece O' Cake Quilt - You'll make a chic new bed quilt that's really a piece of cake! When there's no time to make a full pattern, try these. Jammin Jelly Roll Quilt Floor Cushion - The whole family can enjoy this comfy pillow design. Fab Fat Quarter Lollipops - Fat quarter fabric pops will be fun for quilt and sewing parties. Two Hour Terrifically Thrifty Table Runner - Save time and money with a fast table runner project. Verna Tote Bag - Your charm packs will look so stylish as part of a bag pattern. Kitten in a Box - Cats have taken the world by storm, so there couldn't be a better quick project to make.